There are two iconic NYC landmarks on the corner of 56th and 5th Avenue: Trump Tower and the Abercrombie & Fitch store. One you can see from far, far away, the other you can smell. It’s not necessarily a bad smell — but I guess that depends on how well your tolerance to strong, cheap cologne is. But that’s not what brought me to this area of Midtown today. 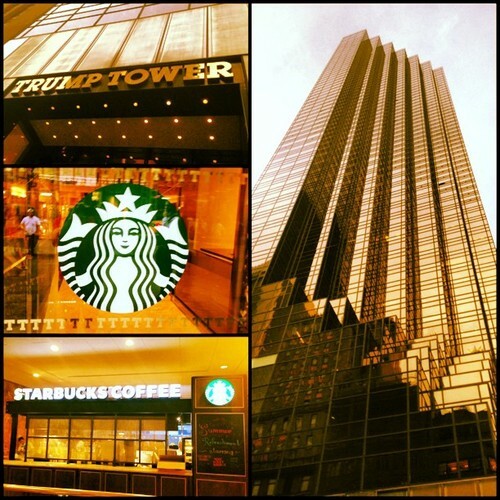 Today, I decided to pay a visit to the Trump Tower to see what kind of condition I would find the Starbucks located inside. Usually most Starbucks located inside another building (office, retailer, what-have-you…) are nothing to write home about, but Trump did this one justice. No — I wouldn’t recommend coming here to spend some quality time with friends, study or try to read anything. 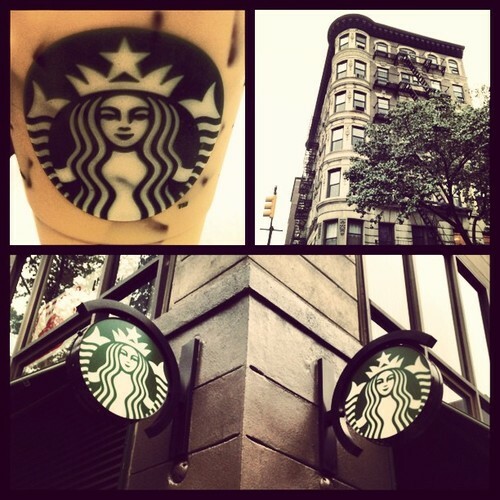 But this Starbucks is simply nice to observe while in the city. As you walk into Trump Tower, you immediately spot the Starbucks located on a small 2nd-floor bridge the overlooks the entranceway. It’s pretty, to say the least. Unfortunately, once I arrived up to the Starbucks’ level, I saw the mob scene that was surrounding the barista bar. I couldn’t figure out where the line started and where it ended. A lot of the scattered seats were empty, but it looked like a crowd of tourists were simply trying to overtake the three baristas inside. This Starbucks technically closed 5 minutes ago (8pm), but fortunately Trump Tower stays open until 10pm so one can still sit and sip for a few more hours. 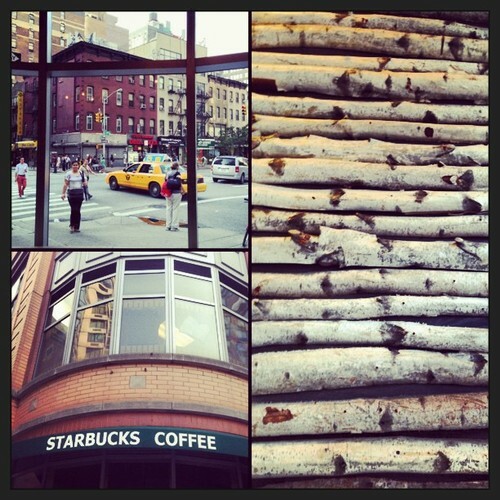 It’s funny how I just keep stumbling upon unseen Starbucks day after day. Just when I think I’ve visited all the locations in a neighborhood, I find another. This one sits in the shadow of the Empire State Building on the corner of 29th and 5th Avenue. It straddles NoMad and Rose Hill on the avenue known for its expensive retailers and prestigious shops. Inside the Starbucks, the crowd is pretty muted. The drink line was short; the seats were only half taken; and most of the patrons are plugged into laptops or iPads. Perhaps, the crowd is less dense than most because there is no public restroom to keep people here for extended periods of time. And I never get tired of watching people walk in then quickly walk out after they realize this public restroom is nothing but a mirage. If this Starbucks was a little bigger (with a little more seating), it may make for the perfect cafe to spend some quality time in. Life has a natural symmetry… a way of balancing things out. 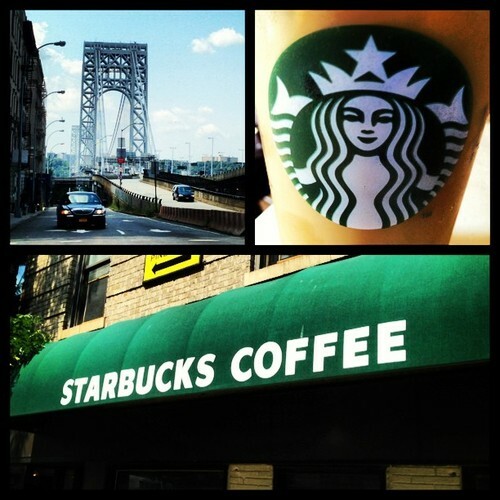 Yesterday, I visited one of the worst Starbucks in Manhattan and today I’m sitting at what is arguably one of the best. 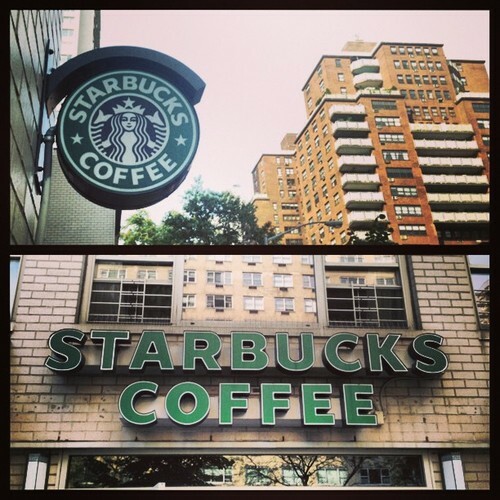 The Upper West Side Starbucks on the corner of 86th & Columbus is roughly the size of three regular NYC Starbucks. 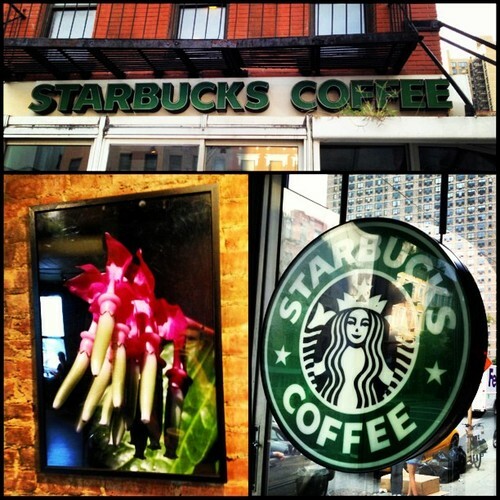 I actually passed by the entrance on my way to grab lunch and as I kept walking I noticed that I was still passing by windows that belonged to the Starbucks. It just goes on and on. 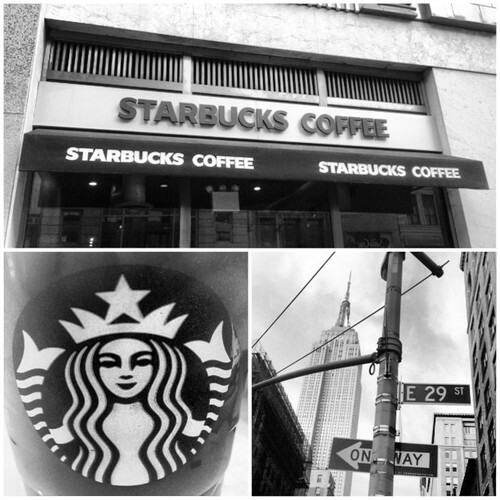 The neighborhood surrounding this Starbucks consists of nice restaurants with outdoor seating, coffee shops (other than Starbucks, that is), a few delis and, of course, Central Park to the east. Inside, the Starbucks has two seating areas equipped with sofas, comfy chairs, tables-for-two and a few larger tables as well. The decor is nice; including a curving mural wall, hanging mirrors, pictures and even some white pillars on display in the window. The lighting is a little dim but not too bad. But, what I think is most impressive about this Starbucks is the lack of a crowd. I’ve been here for quite some time, and there has always been a few seats available — comfy seats at that! There’s even open outlets. 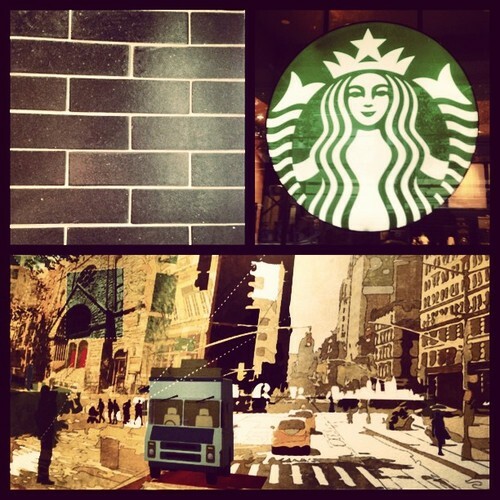 I could go on and on about how much I like this Starbucks. But I’d rather spend a little more time enjoying it instead of writing about it. This weekend I did something I can’t say I’ve done in over a year: I spent an entire weekend without any Starbucks. This was not by choice but an inadvertent reality I had to face when visiting Provincetown, MA. Luckily, what this small town on the tip of Cape Cod lacks in Starbucks, it makes up with culture, beaches, bars and quirky shops to visit. This was my first time in Ptown, and I must say, I’m a huge fan. 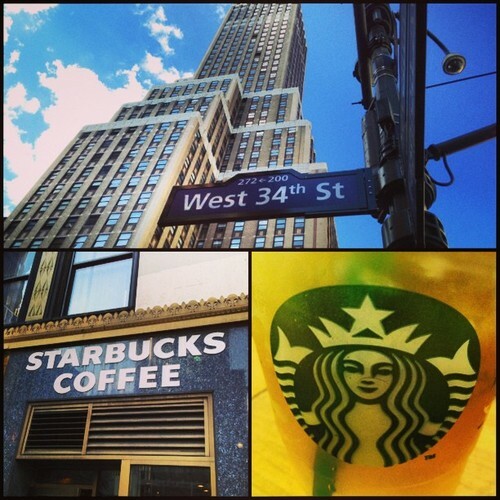 In a way, it’s the anti-New York, and I even enjoyed sampling the local cafes. However, after a long weekend away from NYC, sometimes it feels good to return to the fast paced streets and active lifestyle of a New Yorker. At least there’s Starbuck here. 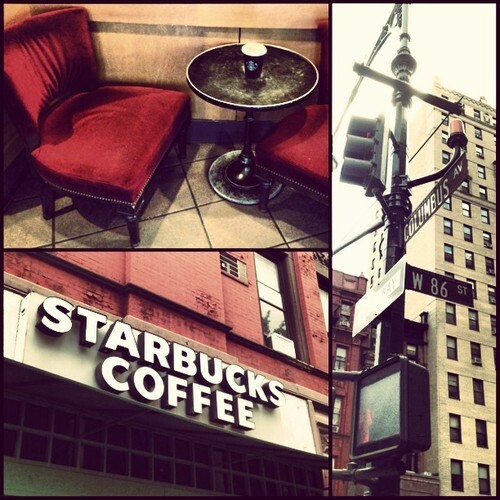 Today, I’m spending some time in a Starbucks on the corner of 27th and 6th Ave. This area is on the border of both Chelsea and NoMad, yet it hardly resembles either neighborhood. This strip of 6th Ave is inundated with quick service lunch restaurants to service the nearby business crowds of the Flatiron district. The Starbucks itself is designed well, but tiny. It’s placed directly on the corner and constructed like the cutout of a circle. There’s no restroom, and — even worse — no seating. Yes, there are plenty of Starbucks in either direction on 6th Ave, but I still see no reason why 8-10 stools can’t be placed facing the window-bar.